The proliferation of Jewish groups in Homestead led to a few efforts to establish umbrella organizations to coordinate activities, eliminate redundancies, and pool fundraising. And as the shul became like a community center, there was a more mundane need to schedule who would use what space at what time and share costs. These groups reflect that not all Jews in Homestead belonged to the synagogue, and not all synagogue members saw the synagogue as their primary Jewish affiliation. The only mentions of this group come from the period in which the second synagogue building was planned and erected. In his speech at the cornerstone-laying, Grossman explained, “We have organized the United Hebrew Charities which is maintained by all the Jewish organizations of the town, and does away with the repetition of the work.” I also suspect that in the aftermath of the fire and in anticipation of the massive fundraising required for the new building, increased mutual aid mattered as well. Their next event was a fun one — “Something New Every Minute,” a series of plays by the Homestead Dramatic Circle under the auspices of United Hebrew Organizations of Homestead on 3/25/1913. Then on 6/19/1913, “The United Hebrew association of Homestead held a meeting last night in their club rooms to help on the erection of the new synagogue on Tenth avenue.” I suspect they met far more often that the record lets on if they had their own club rooms! The last event with which they were connected was a Purim ball on 3/12/1914, also to benefit the building. Perhaps after the building was completed the pressure the urgency was gone…? In the early decades the congregation had strict rules about how the building could be used, even the social space in the building: no card parties or dancing allowing. 3 This comprised the two most popular forms of entertainment at the time. While this was not atypical for the time in an Orthodox congregation, in the context of the synagogue-center movement of the 1920s, which sought to combine the religious functions of the synagogue with the social functions of the Jewish community center, the strictures began to chafe. Moreover, the growing amount of Jewish social life in the community — at least ten organizations — all of which needed to pay for other locations for activities — suggested savings and efficiencies were there a dedicated space. And finally, the example of Pittsburgh, immediately adjacent, gave a model for what a thriving center could do for a community. Of course, the synagogue’s meeting minutes relate nothing of the attempts to establish a separate center of Jewish life in Homestead, though The Criterion has some revealing mentions that suggest that the new hotshot rabbi, Rabbi Winkler, was the driving force behind the movement. There was never a community center in Homestead. In the 1930s the synagogue became more of a social center, and even more in the 1940s when the prohibitions against dances were lifted. One of the unique characteristics of the Homestead community was that people saw that shul as the hub for Jewish life in Homestead. So it wasn’t entirely a loss. Homestead, Pa., Jewish Community Joint Committee:—The Homestead Jewish Community Joint Committee takes great pleasure in announcing the coming” of the community’s annual dance and card party which will be held on Wednesday, March 25. The committee has chosen the beautiful Elks Temple on Ninth Avenue, Homestead, as the scene of this affair, and is bending every effort to make it one to be long remembered. The dances held in previous years have always been well attended by our friends from the entire Pittsburgh district and this year will prove no exception. The committee expects to be able to announce the name of a well-known orchestra engaged far this dance, within a week or two. For those who do not care to dance cards have been provided and beautiful prizes will be distributed. The committee chairmen are as follows: General chairman, Samuel W. Hepps; vice chairman, Mrs. V. Stone; secretary, Miss Pauline Schwartz; program, Mrs. M. Rubin; cards, Miss Sadie Glick and Mrs. A. L. Hepps; tickets. Miss Elsie Hepps; entertainment and music, Paul Carpe; refreshments, Mrs. L. Hadburg; reception, Mrs. A. Glasser and Mrs. Sam Siegel. Starting in 1930 the synagogue’s social committee began to significantly ramp up its work, so perhaps a separate committee seemed less urgent? This group deserves a closer examination in light of all the community’s charitable efforts and the history of the regional UJA campaigns, both of which I intend to investigate in more detail at some point! In the ensuing years, the Homestead District Aid Committee raised money for a number of causes. Small amounts went to local needs; the group is recorded on a number of occasions from 1939-1942 donating money to the shul to cover its local charity work. 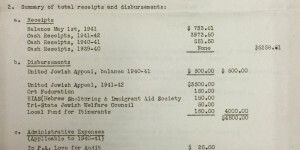 The bulk of the money, though, went to national groups — for ex, in 1942 the Homestead District Aid Committee raised for UJA, HIAS, ORT Federation, State Coordinating Committee, and the National Jewish Welfare Board. At the same time, the regional UJA campaigns were growing in scope. The first local campaign for the UJA took place in 1933, raising money for the JDC and the American Palestine Campaign. Homestead participated in the regional UJA campaign for the first time in 1934 and every year thereafter. 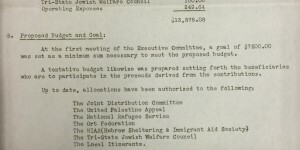 In the 11/3/1941 board meeting when the a “semi-annual report of Homestead District Aid Committee for the UJA and related activities” was submitted, this reflects how the UJA drive was initially subsumed in larger fundraising efforts for a time. But during 1944 the “Homestead District Aid Committee” turned into the “UJA Homestead District Aid Committee,” and thereafter just the UJA. It seems that even under its new appellation the group still raised money for a range of local and national causes, but it appears to have been its own effort rather than a roll-up of representatives of the various other groups in town. In 1955 the UJA discontinued charity funds to the Homestead district, but continued participating in the regional drives. By early 1943 there were many Jewish organizations outside of the shul that all used the shul for events, now that card parties and dances in the vestry rooms (basement) were permitted. Costs had to be managed for renting the space, laundering the linens, and sharing the telephone. And there were many fundraising drives, too, with all that was going on in the world. There was an opportunity to do things more efficiently. Pres of congregation invited other members with him. 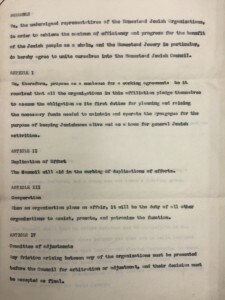 We, the undersigned representatives of the Homestead Jewish Organizations, in order to achieve the maximum of efficiency and progress for the befit of the Jewish people as a whole, and the Homestead Jewry in particular, do hereby agree to unite ourselves into the Homestead Jewish Council. 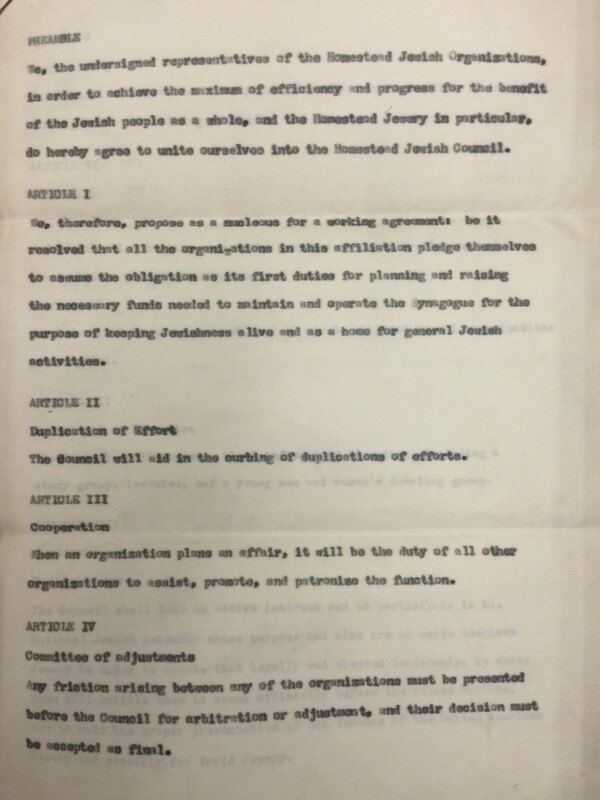 We, therefore, propose as a nucleus for a working agreement: be it resolved that all the organizations in this affiliation pledge themselves to assume the obligation as its first duties for planning and raising the necessary funds needed to maintain and operate the synagogue for the purpose of keeping Jewishness alive and as a home for general Jewish activities. The Council will aid in the curbing of duplications of efforts. When an organization plans an affair, it will be the duty of all other organizations to assist, promote, and patronize the function. Any friction arising between any of the organizations must be presented before the Council for arbitration or adjustment, and their decision must be accepted as final. The sections went on to cover fundraising, scheduling, education, world affairs, UJA and JNF drives, and more. In the 5/9/1943 board meeting, a letter from Max Wolfson and above preamble and by-laws were read and discussed, producing no agreement. (If the board ever came to an agreement, it was not recorded.) And to be honest, if this group ever functioned, I can find no evidence of it — it’s not mentioned further in the synagogue or Sisterhood meetings, nor is it mentioned in the Pittsburgh Jewish newspapers at all. Hmmm….! At any rate, the organizations went on throwing events, singly or in collaboration, and Jewish life in Homestead went on, though by the 50s it was in decline. I cannot even name 12 organizations. The first four below are the ones that were listed everywhere. The rest are possibilities.